Independent bottlings of the “lava of the Cuillins” are rare as hen’s teeth nowadays and have never been common so I’m quite happy to have this one in my possession. Even if the bottle’s diminutive size means this sample is a once-a-year treat at best. The whisky was, and remains, a cracker. Distilled in July 1979 and bottled in December 1997 this is about as “hot” as any Scotch single malt whisky I’ve ever tried, not specifically in alcoholic strength (61.6% ABV) but more in the discernible burn it creates. Sauternes in colour, 18 years in oak has done little to restrain this beastie. 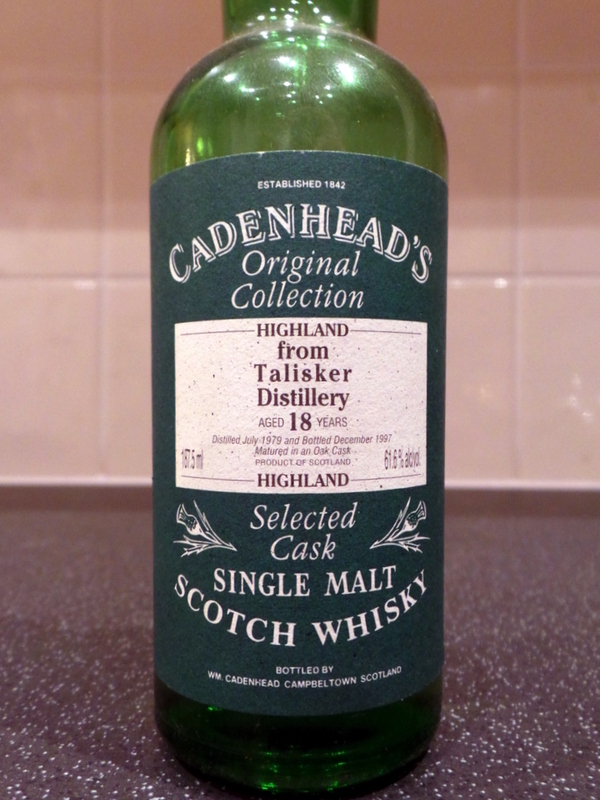 It’s most definitely a Talisker and properly old school. On the nose, there’s pepper, smoke, rich creamy barley and a little heathery perfume. Despite its strength, alcohol is far from conspicuous at this point. To taste, however, it almost erupts over the tongue, stinging then numbing the lips on the way in. Briny, peaty, spicy, a little vanilla and cedar wood, the flavours are delivered like tiny fire crackers. This could give many an Islay a painful (metaphorical) kick in the groin in one-on-one combat. The aftertaste lingers. And lingers. If only I could get hold of more of this. Failing that, let’s see if I can keep this tiny atom bomb going another 15 years.